Pharmacy Billing Services in Alabama, California, Texas, Florida, Ohio, Illinois, Maryland, Michigan, Missouri, New Jersey, NJ, New York, NY, Oklahoma, Pennsylvania, San Antonio, Tennessee, Georgia, Houston. Patients who are coming to your medical industry are in urge need of medicines. If medicines are provided in your medical industry then there will be no necessary for your patients to rush up to some of the pharmacies for medicines. If your medical industry has got inpatients then you will surely have a pharmacy. The medical industry can get a good amount of revenue from pharmacies when they are maintained with well-equipped software and other features. All your medical industry need is to improve the software of pharmacy billing services which will gradually improve your revenue in short span. We have better coding services which will surely enhance the bills of your pharmacy section without any issues. Usually the bills will be mixed up between kinds of patients or money will be calculated extra. To avoid such kinds of issues we are providing best softwares which will detect the prices of each medicine of specific disease. The staffs who are working in bill counter no need to worry about any mistakes anymore because our coding software has got top levels of codings which will create better bills without any errors. We strictly follow HIPAA rules, so your medical industry can surely trust our medical billing servic­­­­­­­­es and provide us and chance to increase your source of income. Any changes made in the law will be implemented in our softwares without any time delay. 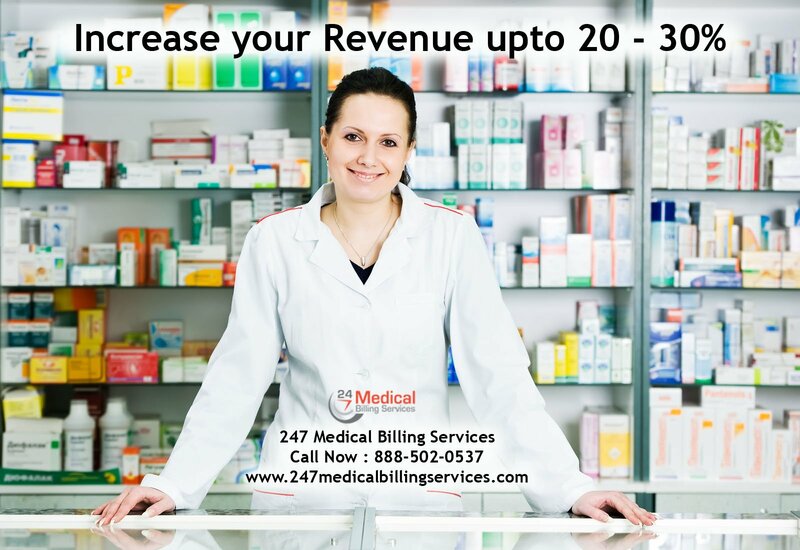 We assure that your medical industry revenue will get increased by 10 to 20% after getting our billing services. We are having special experts who are ready to work in effective ways to provide better ideas for increasing your Revenue Cycle Management. We provide our help services for any hour of the day. We don’t make any compromises for explaining or solving technical issues. You can surely get clear idea from us about any of the accounts or software without any issues. Our experts will clear you doubts either through call or in virtual environment. Make sure that your medical industry is giving perfect account receivables within maximum of 30 days to boost your revenue levels. We assist with increasing your AR from our experts of accounts. We provide better reports than any other services. We provide monthly, weekly reports from our software. Our software is capable of generating any type of report which you are in need of. We have got some 12 years of experience in doing these billing services. We are looking forward to help your medical industry. We have got some of the happy clients all over the world. Our services have got better cost package rather than other billing services. We provide 30 day trail packages of softwares to make sure that you are satisfies with our softwares. Our experts customize the software according to your ideas and deliver the best products in your hands to work for patients. We have got some of the happy clients; just leave us a message or mail to get services from us.